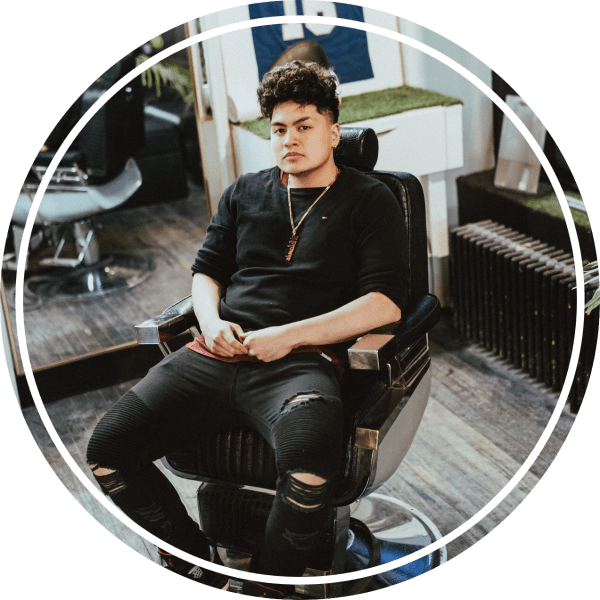 Regardless if you have straight, wavy or curly hair, there is a plethora of hairstyles for men with thick hair at hand. This generous hair type allows you to experiment with short and long haircuts alike, all with numerous styling options. However, it can be stressful to maintain if you’re not careful. Learn how to make the most of your thick hair with these awesome ideas. If you’re a man with style, never underestimate the power of a slightly slicked back hairstyle. 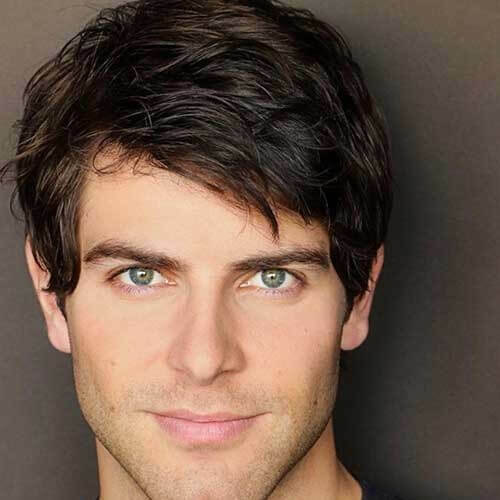 While this one isn’t entirely gelled, it has just enough of a laid back look to complement your thick hair. It’s ideal for formal occasions, but can also be worn in an office or even casual environment. More of a chin-length hair kind of guy? 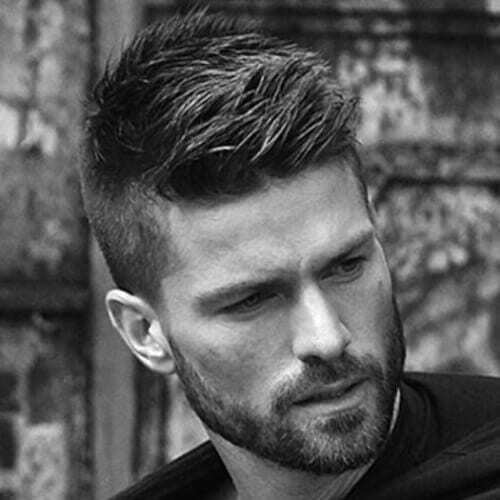 Well, this just might be one of the best hairstyles for men with thick hair for you. 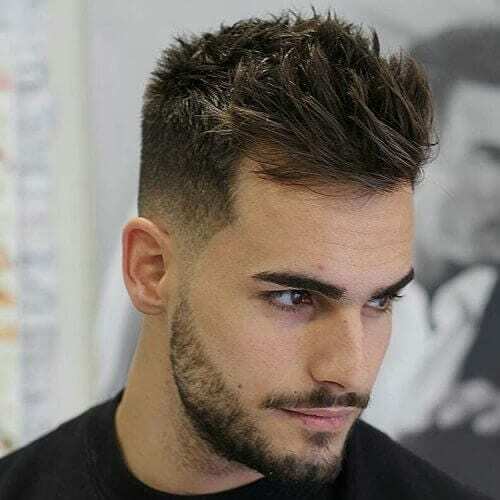 It looks particularly well on men with wavy or curly hair, but don’t hesitate to get this haircut even if your hair is straight. As for men who prefer rocking long locks, there are so many styling options that they deserve a list of their own. 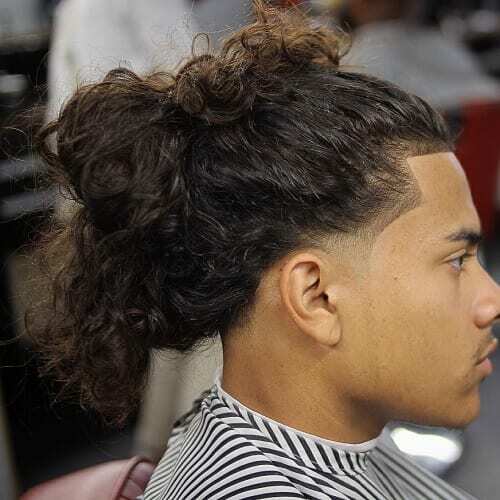 One of the most popular hairstyles in recent years is the “man bun”, essentially a top knot for men. Leave the top with longer hair and wrap it back with the help of a hair tie. Want a hairstyle that’s straight up formal? This fully slicked back hairstyle works for men with straight or wavy hair, especially if they have a black tie event coming up. It’s a brilliant and timeless hairstyle for grooms, in particular. If you want to cut back on major maintenance time, a short hairstyle is what you’re in need of. While this spiked hairstyle is indeed short, it still allows you to style it a bit if you want to switch things up from time to time. The low cut sides are a nice touch for an appealing outcome. 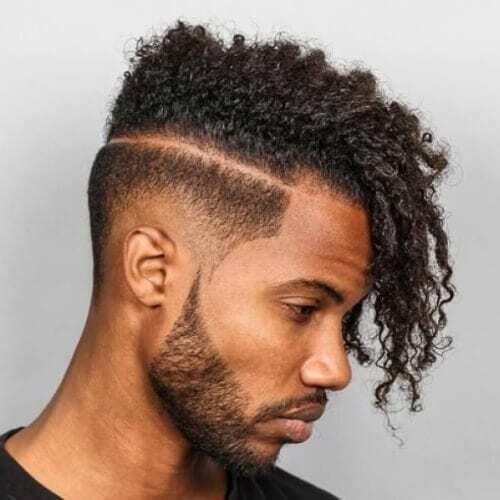 Curls can prove to be a styling challenge for men, especially if their hair is thick. One of the easiest ways to manage curly and thick hair is to get a well-trimmed base. 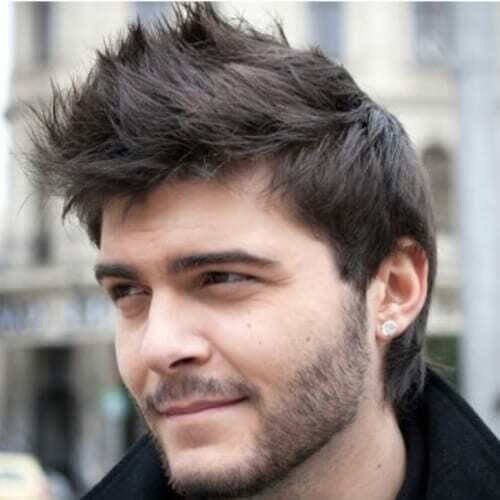 For instance, you can keep the top part a bit longer and shave down the sides in a faded fashion. 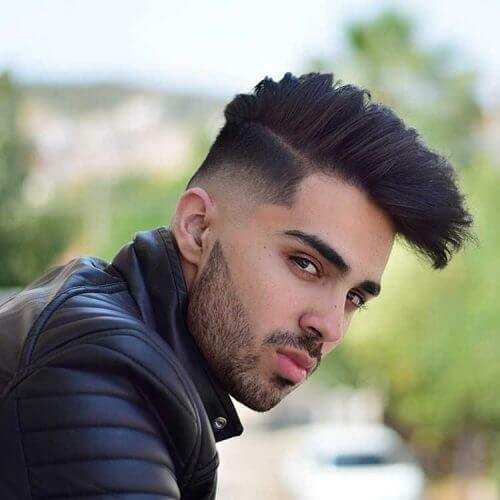 Without a doubt, taper fade haircuts are one of the trendiest hairstyles of all for men. 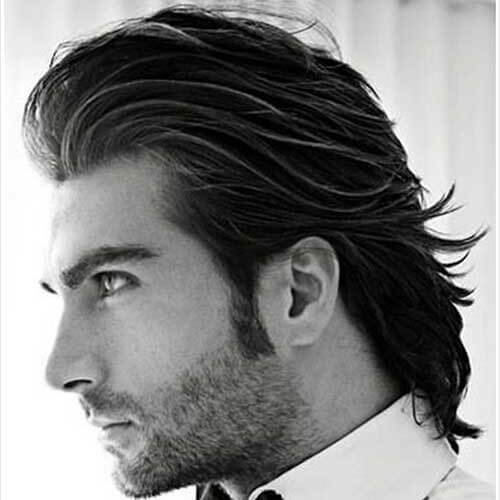 Even more so, men with thick hair can enjoy this low-maintenance hairstyle without any problems. For curly locks, you can consider keeping the bangs long in front. 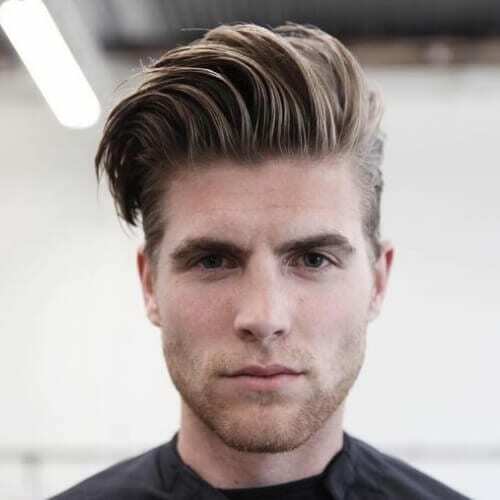 In addition to taper fades, quiffs have taken the men’s hairstyles world by storm. It’s obvious why the haircut is all the rage; it harmoniously combines dandy and edgy. 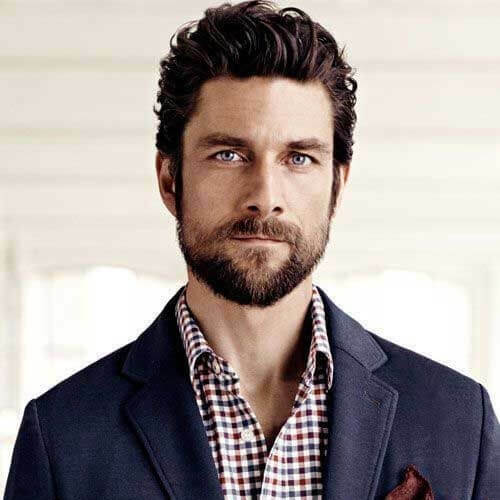 This is a versatile hairstyle that can be sported by men of all ages, particularly those with thick hair. Wavy is clearly a generous hair texture, especially when you’re dealing with thick hair. 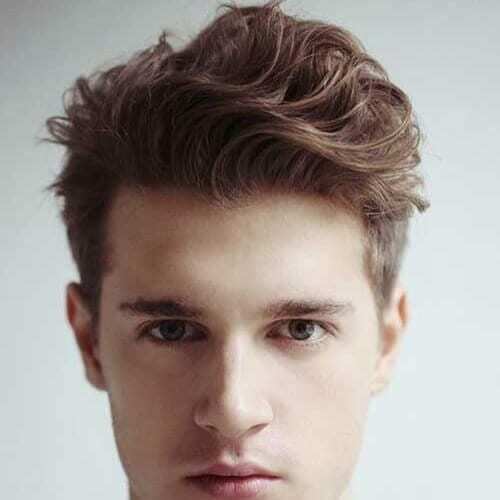 For men, they can take advantage of the waves for a dynamic hairstyle, which can be spiked or slicked with ease. Consider a subtle beard to complement the look. There’s nothing that says “manly” quite like a messy hairstyle. 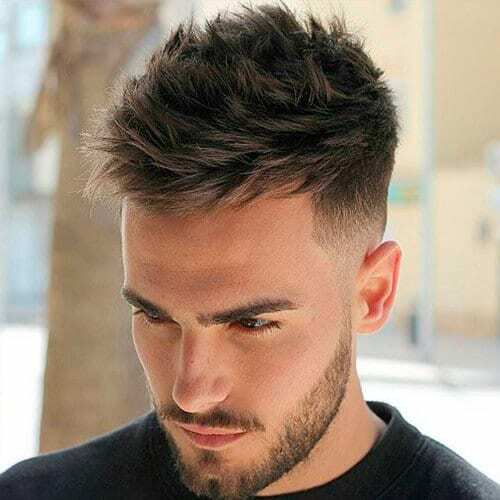 This medium length haircut is oozing with style and attitude, from the carefree strands sprawled all around to the effortless handsome look at the end. 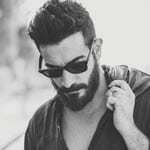 Aside from being a statement, beards are incredibly fashionable and have gained more popularity than ever before in recent years. 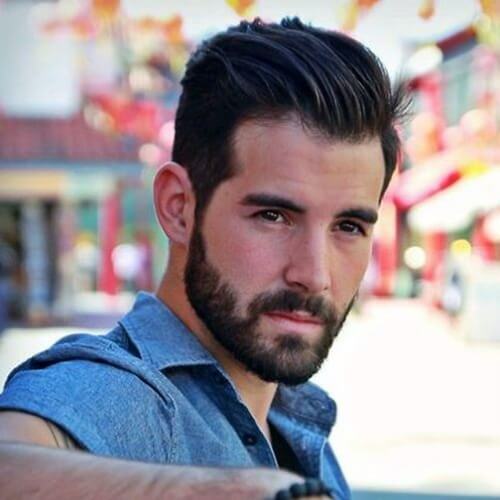 In this photo, you can see how a sleek hairstyle and medium beard go hand in hand perfectly. Want to add a twist to your hairstyle, literally? One of the top ways to do so is with side bangs. While you don’t have to go full-out “emo hair”, you can have a few strands that casually go across your forehead to the side. For a polished look, don’t hesitate to take advantage of your thick hair with a cut like this. It’s discretely cut down on the sides, leaving a full top that can be styled easily in different ways. It’s a professional and clean cut look all around. Another attitude-filled look is this fetching shoulder-length haircut. While you would normally expect longer hair to give off an exclusively edgy look, the skilled layering completely changes the hairstyle. Add some highlights for more shape. It’s one thing to have thick hair, but having yours thick and coarse can be problematic from time to time. To make sure that you don’t have yet another reason to stress out before work in the morning, opt for a short and stylish haircut with a 5 o’clock shadow. Barber hairstyles are an awesome choice for men, no matter what hair texture they have. This man with afro-textured hair, for example, chose a full head of dreadlocks and a well-contoured beard. The locs can be wrapped in a top knot for comfort and style. If you’re all about business and you want your appearance to reflect this trait, this is the hairstyle for you. It’s professional, admirable and sure to help you seal any deal that comes your way. If you match it with a beard, we recommend keeping it properly groomed. Most men opt for their natural hair color. However, the outgoing gang will never hesitate to experiment with color. This is an example of how you can make a crew cut with short layers remarkable, simply by lightening the top. Dare to go against the grain with a rebellious hairstyle to bring the best out of your thick hair. 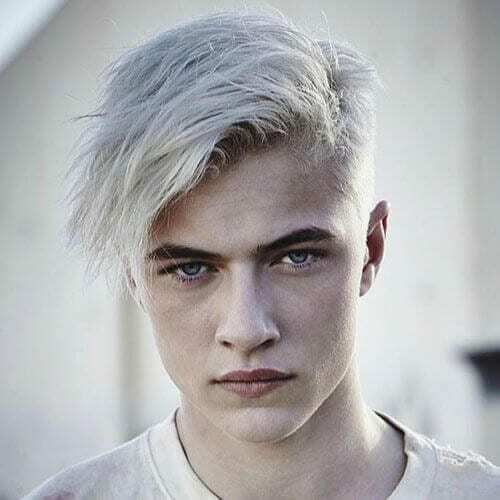 Aside from the long bangs tossed to the side, this hairdo shines through an icy platinum blonde color. It’s an excellent option for men with blue or green eyes. Zac Efron is not only a talented actor, but also a style icon of his generation. One of his youthful grooming choices is this surfer-inspired haircut. Even if you’re not a teenager, this is a hairstyle you can count on for a fresh look. 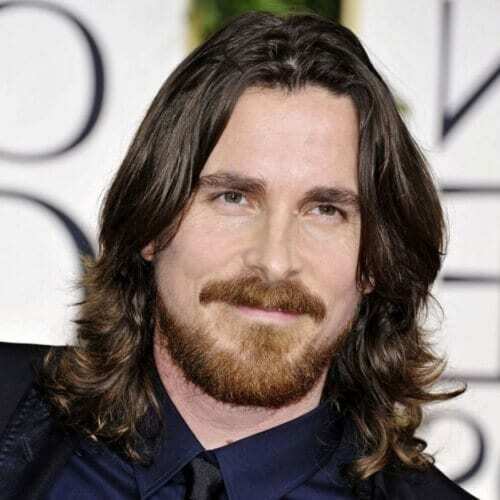 Another celebrity we always have our eyes on is Christian Bale. The esteemed actor isn’t afraid to rock long hair, and we admit it suits him quite well. 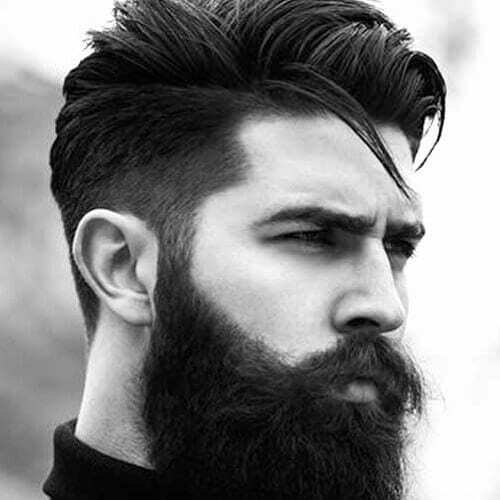 If you go for long thick hair, you can keep an equally thick beard in mind. 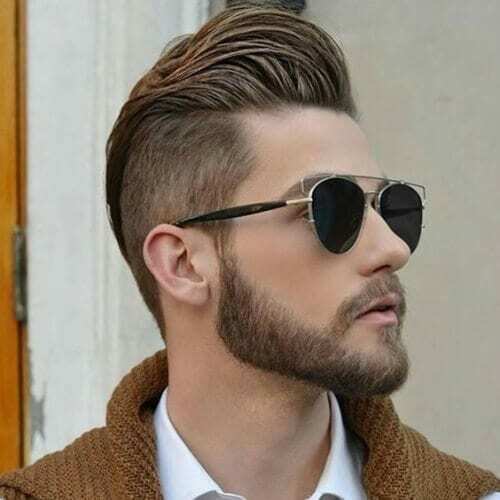 Not too long, not too short, this is an exceptional hairstyle for men seeking balance. It looks the best with wavy hair, but you can sport it with any other texture as well. The main focus is on the full, messy bangs in front. This is a double-example on our list. 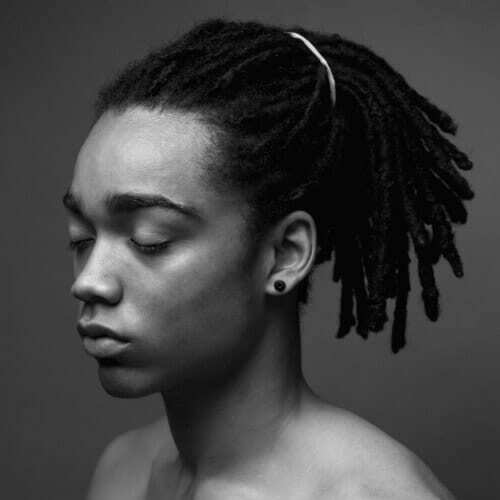 Firstly, it showcases shoulder-length, medium-sized dreadlocks. Secondly, it offers inspiration for styling, in case you don’t want the locs to fall in your face. Simple, practical and flattering for thick hair. While a great deal of slicked hairstyles are combed back, this one shows how you can style yours to the side. The length of the hair allows you to try out different gelled looks, whether they’re on a side, to the back or as bangs. Having longer hair has its fair share of advantages. One of the most significant ones is being able to tie it up. This hairstyle works if you want to prevent your hair from getting in your face, or if you want to mix edgy with elegant. 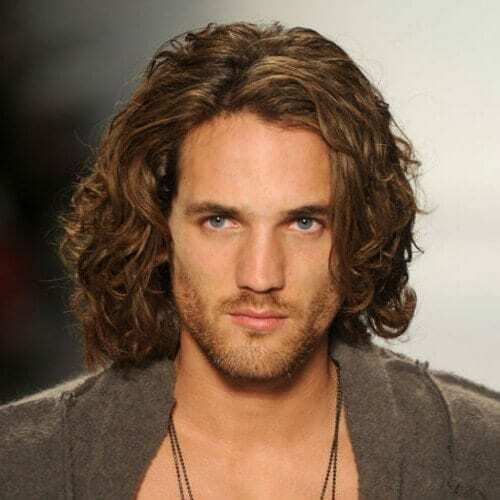 Men with curly, thick and long hair also enjoy a multitude of styling options. You can go for a classic man bun or another type of messy top knot, like the one shown here. Don’t be afraid to get the front, sides and back cut by an expert barber. 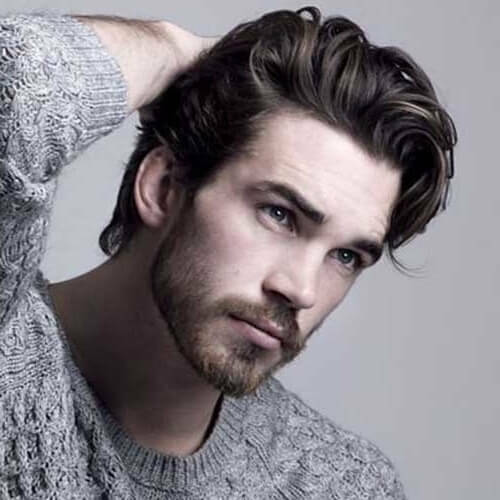 Here you can admire yet another effortless hairstyle for men with thick hair. It’s one of the best choices for those who don’t have the necessary time or patience for excessive styling. With just a bit of hair product, you can rake your fingers through your hair for an easygoing style. It’s crystal clear that dreadlocks are becoming more and more popular, but how about the ways you can get them? 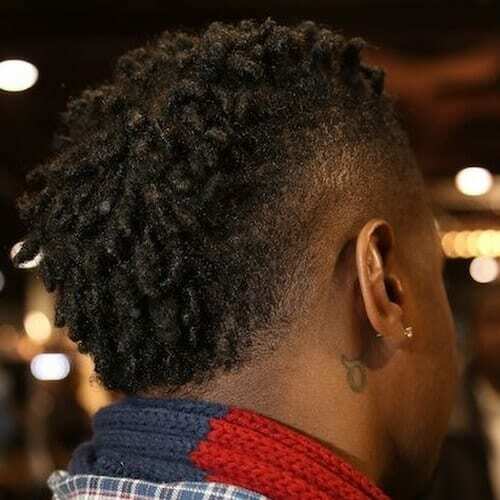 We have talked about well-contoured dreads, but you should also consider the neglect or free form method. Nothing says smart, suave and stately like a splash of gray in a man’s hairstyle. Even if it isn’t provided by naturally graying hair, it adds a captivating touch to the entire look. Consider some ash highlights for your medium length thick hair. A strong personality deserves an equally powerful haircut. 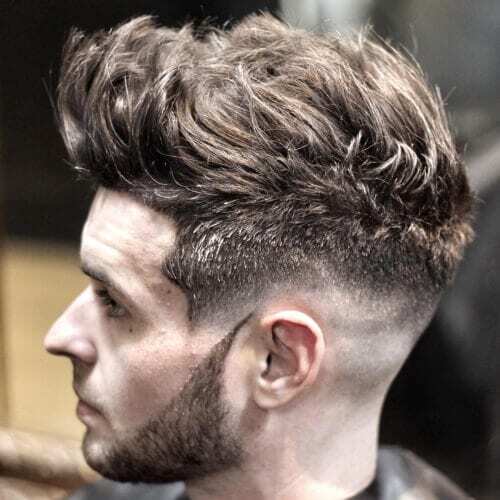 A steep undercut is perfect for men who aren’t ashamed to show their rebellious side. For a greater impact, leave the rest of your hair long and toss it to the side. If you’re fortunate enough to have thick hair, why not rock a thick beard too? This photo shows how the two details go hand in hand amazingly. The result is charming, with just enough class and attitude. You most likely know by now that faux hawks come in all sorts of shapes and sizes. If you want to recreate a mohawk and you have thick, straight hair, this is the approach for you. Gently style the top part upwards and the sides and back down. 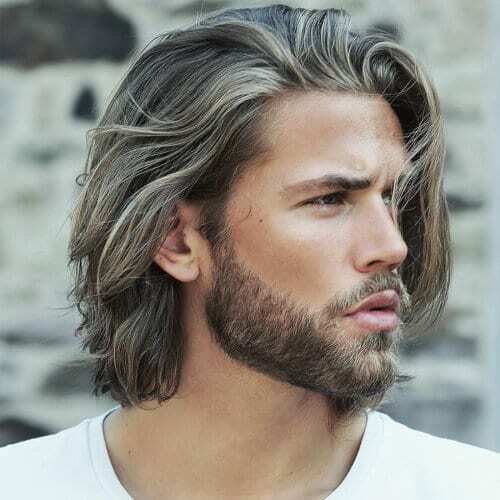 Mature men also enjoy a wide range of hairstyles to complement their thick locks. This choice is appropriate for men of all ages, but especially for those over 40 or 50. The results are dapper indeed. Want a more youthful approach to your hairstyle? Always think about faded undercuts and longer tops. A nice perk about this haircut is that you can choose any length you want for the top part, as long as the sides and back are shaved down accordingly. 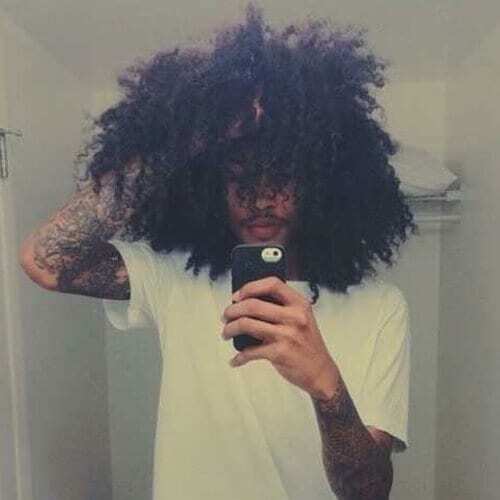 Black men who prefer sporting longer locks should always keep afros in mind. This hairstyle is eye-catching, in the best way possible. In addition, it can be easily tied back if you don’t want your curly locks falling into your face. The pompadour is undoubtedly a timeless haircut that has always had an aristocratic allure. A modern adaptation of this classic hairstyle can include some subtle highlights, using a shade or two lighter than your natural hair color. A corporate environment often calls for a professional hairstyle. If you’re not into keeping your hair really short, you can count on this fine-looking haircut for your business needs. It’s just the right length to leave a proper impression. 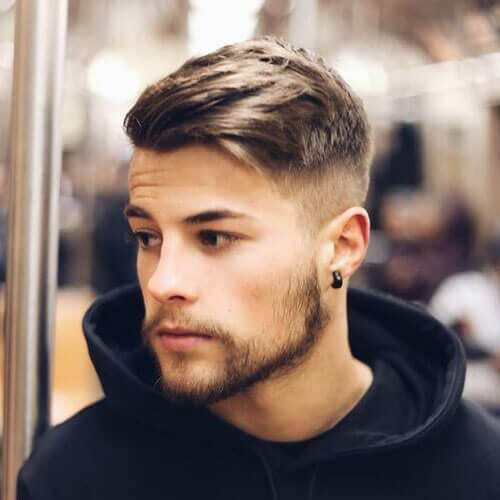 A common trait found in all trending hairstyles for men this year is shaved sides. In almost all cases, the shaving is done with a gradual transition from the top to bottom. You can consider this aspect for almost any haircut you have in mind. Although spiky hair is usually associated with the 90s, you can still rock it now if you know how to do it right. 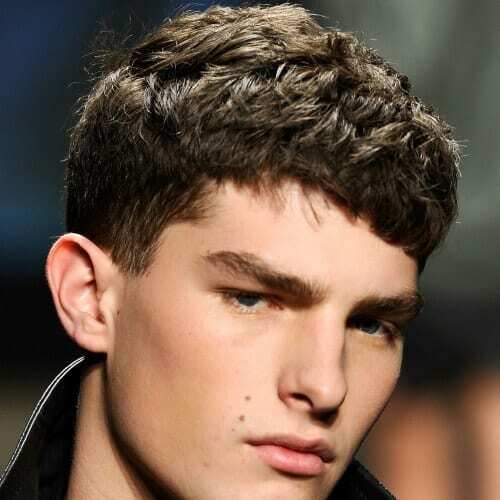 Instead of keeping the spikes accentuated through heavy hair product use, go for a casual and messy look. You should pay attention to your appearance just as much as any other aspect of your wedding. 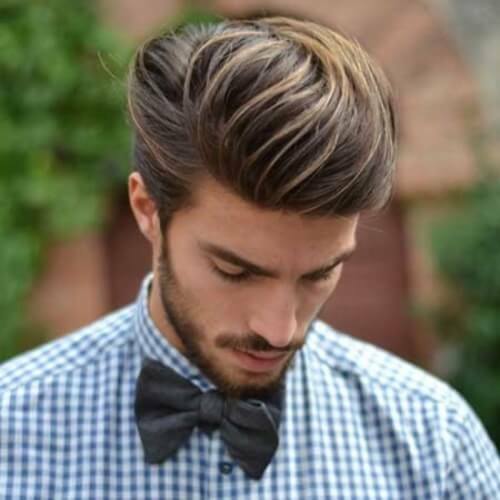 For your hair, get inspired by this gentleman-like style. It comes off as effortless, all while maintaining a classy tone. The traditional box fade haircut for afro-textured hair has been stylish for decades. 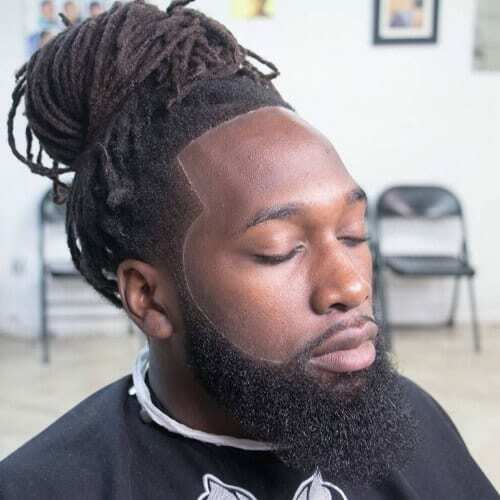 It’s the perfect hairstyle for African American men who want a fresh yet old school expression through their look. Young, wild and free? 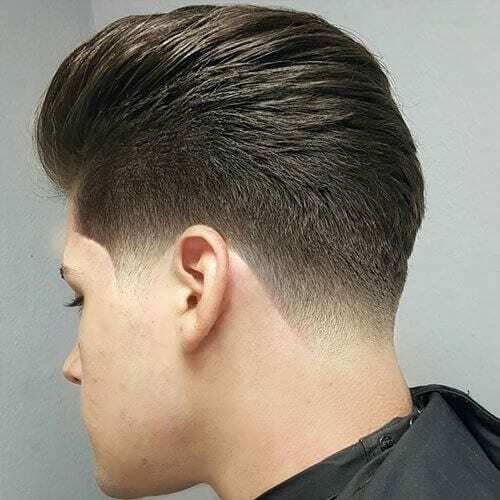 You can find all of these lively qualities in this smooth haircut. 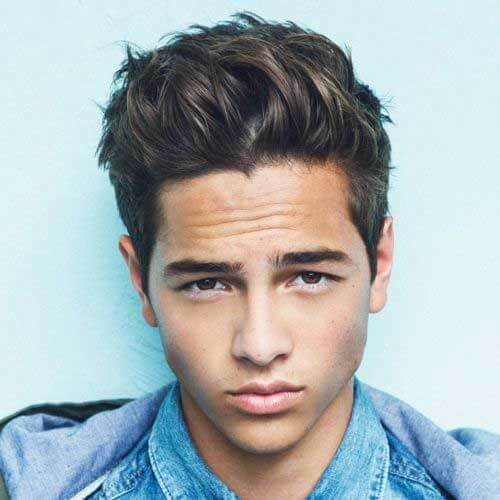 Even though it works the best for teenagers or men in their 20s, don’t hesitate to style your hair this way at any age. 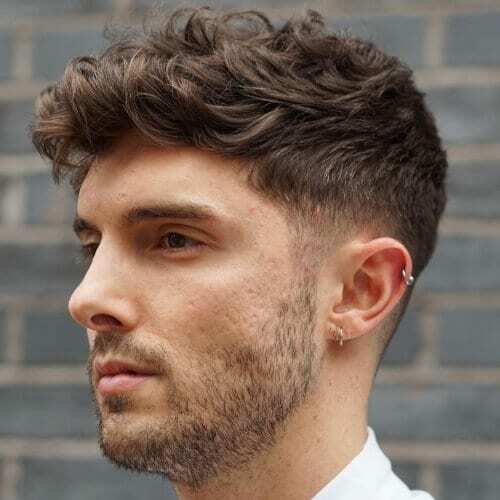 Looking for a modern classic type of haircut for your thick hair? Think about combining a traditional hairstyle with a cool new one. For instance, you can try out a faux hawk with the sides shaved down. After that, style the top like a pompadour. Never underestimate the power of facial hair when putting your look together. If you have a round face, you can grow a beard to outline your face flatteringly. 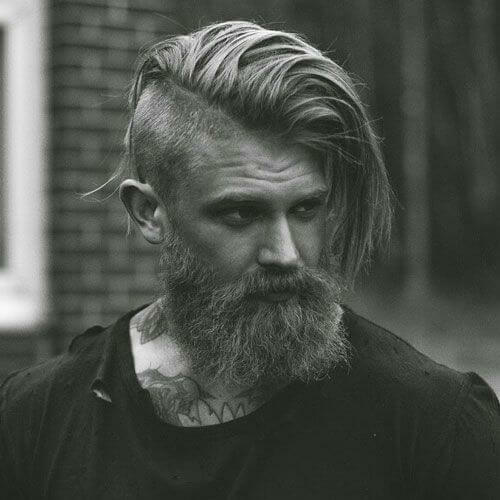 As for the top part of your hair, go for rugged and careless. Small twists are a memorable choice for afro-textured hair. But how can you make your hairstyle stand out from the crowd? A mohawk or undercut can take you far. Shave the sides from top to bottom for an alluring outcome. Want a funky hairstyle? Shaved and braided is the way to go. 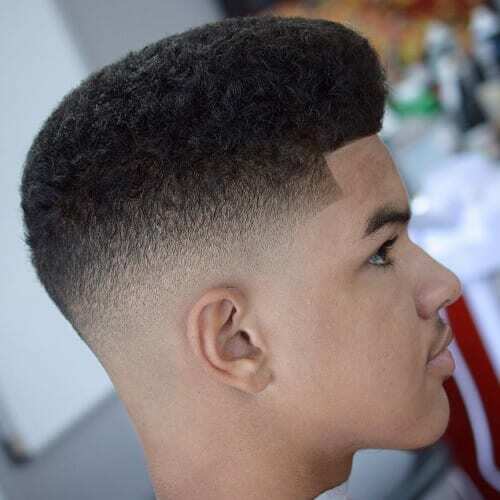 Get a high taper fade haircut, leaving the top part a few inches long. 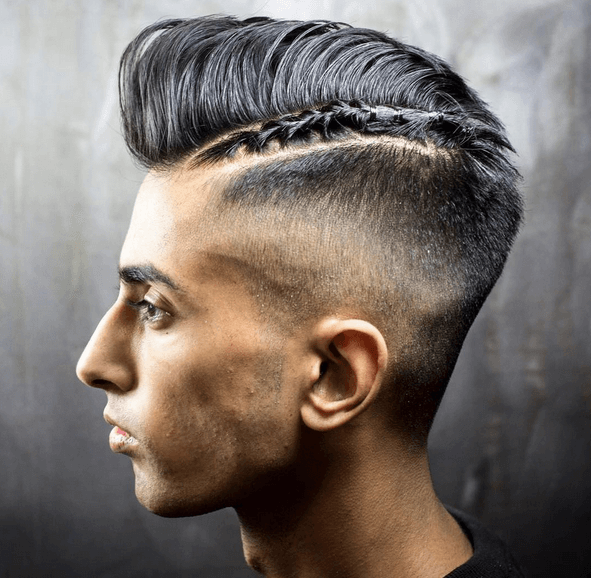 On one side, ask your barber for a surgical line, and braid the hair directly to the right. Simplicity is the key to countless successful hairstyles. In this example, it’s all about having a good silhouette for the hairstyle. From that point on, no styling is required unless preferred. 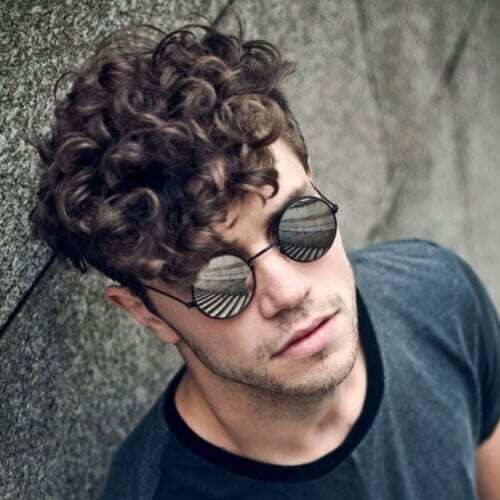 If “cool” is your middle name and you have curly hair, this is the type of hairstyle you’re looking for. It emphasizes your playful hair texture, while maintaining picture-perfect length. If we’ve said it once, we’ve said it a thousand times – it’s all in the shaved sides. Not sure how to obtain a sharp look without coming off as too princely? This hairstyle consists in long and swept back top, complemented by a flawless undercut. The well-groomed beard is definitely another aspect to consider. 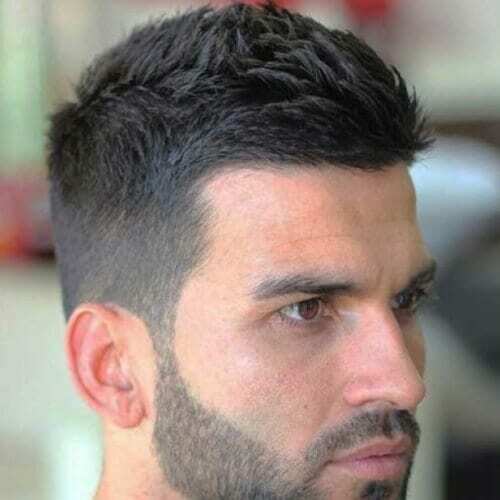 To wrap up our favorite hairstyles for men with thick hair, here is a low taper fade idea. It accentuates the thickness of the hair and shapes it attractively at the same time. Moreover, it’s suitable for young and mature men alike. 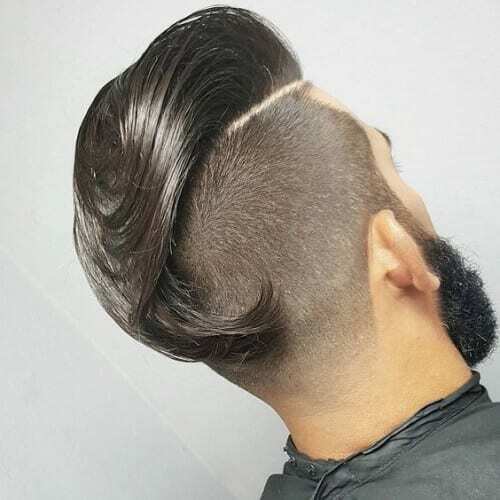 In conclusion, there is no limit to the hairstyles for men with thick hair you explore. Almost all of them can be adapted for curly or straight hair, and the majority are appropriate for all situations. Before you decide your final option, take some time and consider your personality, work environment and personal style.